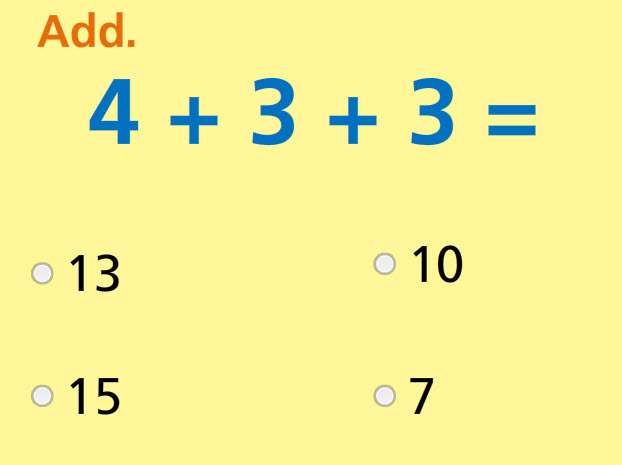 Add three numbers in this interactive math test and get rapid feedback. Two of the numbers are doubles (the same). By taking this test, students show their level of understanding of one of the basic math addition topics, adding doubles. With continued practice, students can retake this test to show level of improvement. Return from this Add Three Numbers Use Doubles Math Test to the Elementary Math Tests , 1st Grade Math Tests webpage, or to Math Tests.